The cart features a black steel frame with four wood grain shelves – including one adjustable. Also has cable management grommets, power strip and casters and comes with a 1 year limited warranty. 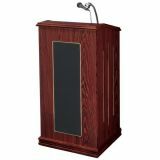 With a wide reading surface, fluorescent lamp, and full-feature amplifier these lecterns command a dignified presence. 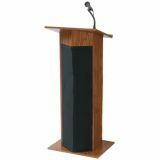 Available in medium oak or mahogany.